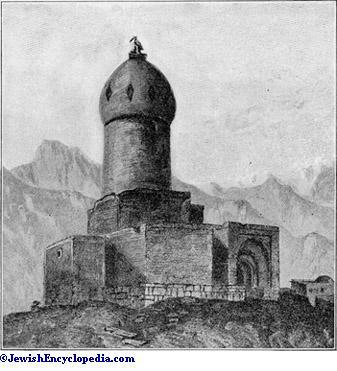 Traditional Tomb of Esther and Mordecai. 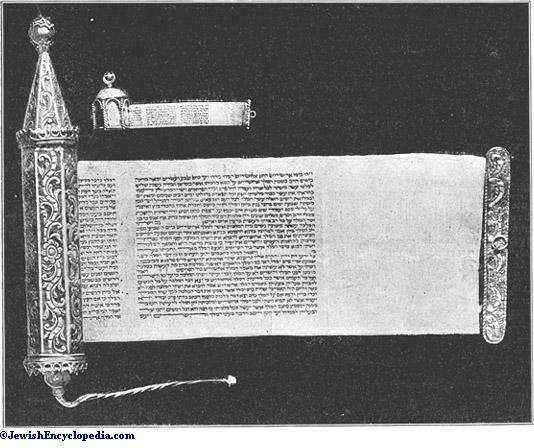 The Jews, assisted by the royal officers, who feared the king, were eminently successful in slaying their enemies (ix. 11), but refused to avail themselves of their right to plunder (ix. 16). The queen, not content with a single day's slaughter, then requested the king to grant to her people a second day of vengeance, and begged that the bodies of Haman's ten sons, who had been slain in the fray, be hanged on the gibbet (ix. 13). Esther and Mordecai, acting with "all authority" (ix. 29), then founded the yearly feast of Purim, held on the fourteenth and fifteenth of Adar as a joyous commemoration of the deliverance of their race. Still Ahasuerus will not be baffled. Consulting Mordecai, he endeavors to arouse Esther's jealousy—thinking that this will loosen her tongue—by again gathering maidens in his courtyard, as though he is ready to mete out to her the fate of her unfortunate predecessor. But even under this provocation Esther preserves her silence. Mordecai's daily visits to the courtyard are for the purpose of ascertaining whether Esther has remained true to the precepts of her religion. She had not eaten forbidden food, preferring a diet of vegetables, and had otherwise scrupulously observed the Law. When the crisis came Mordecai—who had, by his refusal to bow to Haman or, rather, to the image of an idol ostentatiously displayed on his breast (Pirḳe R. El. lxix. ), brought calamity upon the Jews—appeared in his mourning garments, and Esther, frightened, gave birth to a still-born child. To avoid gossip she sent Hatach instead of going herself to ascertain the cause of the trouble. This Hatach was afterward met by Haman and slain. Still Mordecai had been able to tell Hatach his dream, that Esther would be the little rill of water separating the two fighting monsters, and that the rill would grow to be a large stream flooding the earth—a dream he had often related to her in her youth. 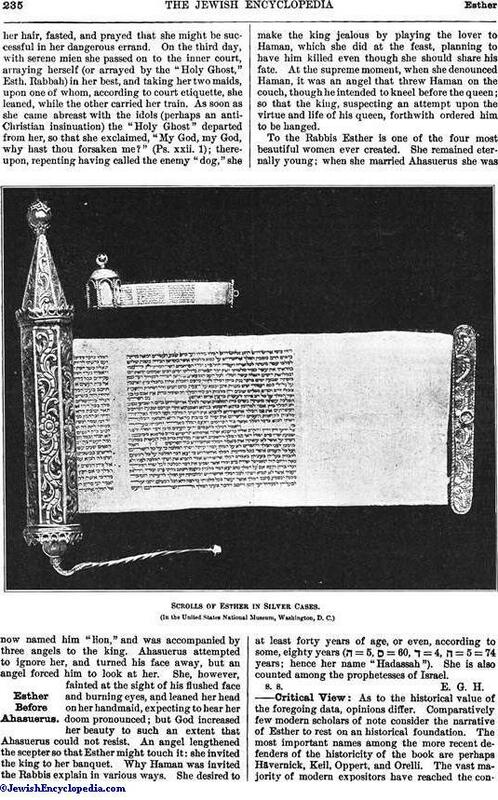 Scrolls Of Esther In Silver Cases. 1. 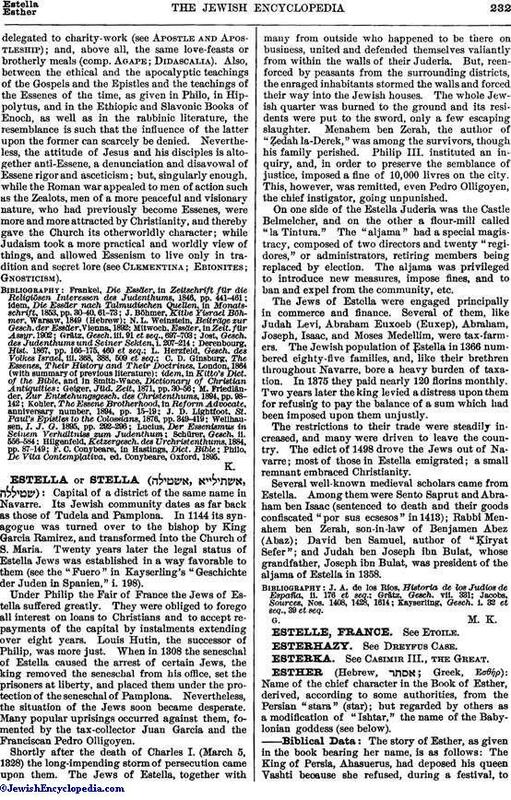 It is now generally recognized that the Ahasuerus ( ), mentioned in Esther, in Ezra iv. 6, and in Dan. ix. 1, is identical with the Persian king known as Xerxes (Ξέρζης, "Khshayarha"), who reigned from 485 to 464 B.C. 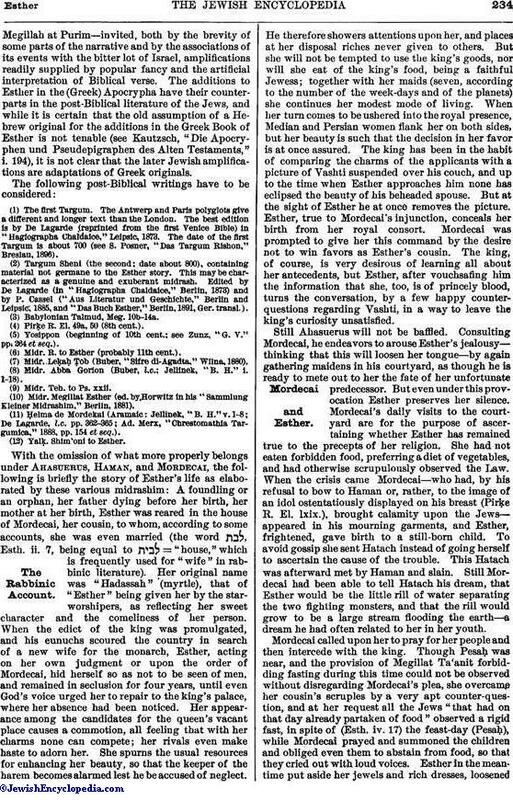 ; but it is impossible to find any historical parallel for a Jewish consort to this king. Some critics formerly identified Esther with Amastris (Ionic, "Amestris"), who is mentioned by Herodotus (viii. 114, ix. 110; compare Ctesias, 20) as the queen of Xerxes at the time when Esther, according to Esth. ii. 6, became the wife of Ahasuerus. Amastris, however, was the daughter of a Persian general and, therefore, not a Jewess. Furthermore, the facts of Amastris' reign do not agree with the Biblical story of Esther. Besides all this, it is impossible to connect the two names etymologically. M'Clymont (Hastings, "Dict. Bible," i. 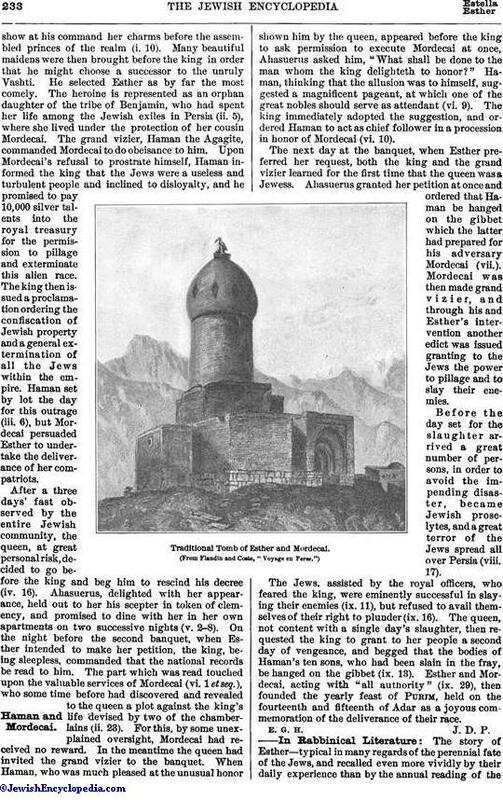 772) thinks it possible that Esther and Vashti may have been merely the chief favorites of the harem, and are consequently not mentioned in parallel historical accounts.It is very doubtful whether the haughty Persian aristocracy, always highly influential with the monarch, would have tolerated the choice of a Jewish queen and a Jewish prime minister (Mordecai), to the exclusion of their own class—not to speak of the improbability of the prime ministry of Haman the Agagite, who preceded Mordecai. "Agagite" can only be interpreted here as synonymous with "Amalekite" (compare "Agag," king of the Amalekites, the foe of Saul, I Sam. xv. 8, 20, 32; Num. xxiv. 7; see Agag). Oppert's attempt to connect the term "Agagite" with "Agaz," a Median tribe mentioned by Sargon, can not be taken seriously. The term, as applied to Haman, is a gross anachronism; and the author of Esther no doubt used it intentionally as a fitting name for an enemy of Israel. In the Greek version of Esther, Haman is called a Macedonian. 5. Finally, in this connection, the author's knowledge of Persian customs is not in keeping with contemporary records. The chief conflicting points are as follows: (a) Mordecai was permitted free access to his cousin in the harem, a state of affairs wholly at variance with Oriental usage, both ancient and modern. (b) The queen could not send a message to her own husband (!). (c) The division of the empire into 127 provinces contrasts strangely with the twenty historical Persian satrapies. (d) The fact that Haman tolerated for a long time Mordecai's refusal to do obeisance is hardly in accordance with the customs of the East. Any native venturing to stand in the presence of a Turkish grand vizier would certainly be severely dealt with without delay. 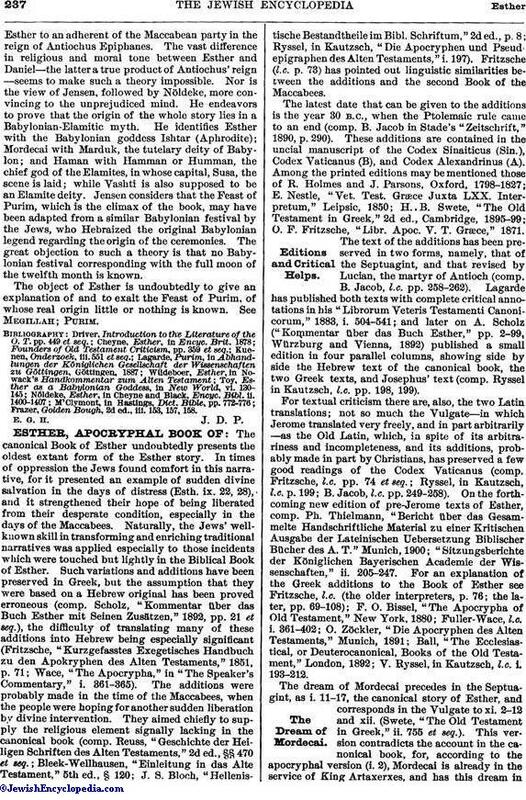 (e) This very refusal of Mordecai to prostrate himself belongs rather to the Greek than to the earlier Oriental period, when such an act would have involved no personal degradation (compare Gen. xxiii. 7, xxxiii. 3; Herodotus, vii. 136). 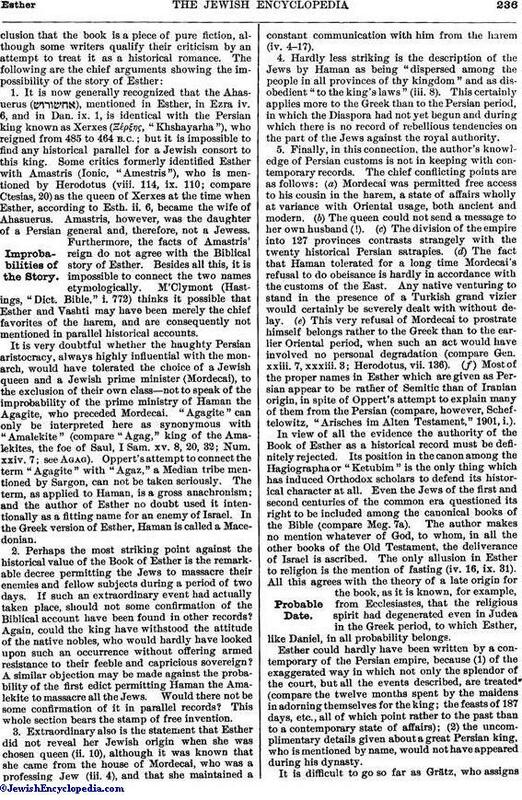 (f) Most of the proper names in Esther which are given as Persian appear to be rather of Semitic than of Iranian origin, in spite of Oppert's attempt to explain many of them from the Persian (compare, however, Scheftelowitz, "Arisches im Alten Testament," 1901, i.). Frazer, Golden Bough, 2d ed., iii. 153, 157, 158. E. G. H. J. D. P.